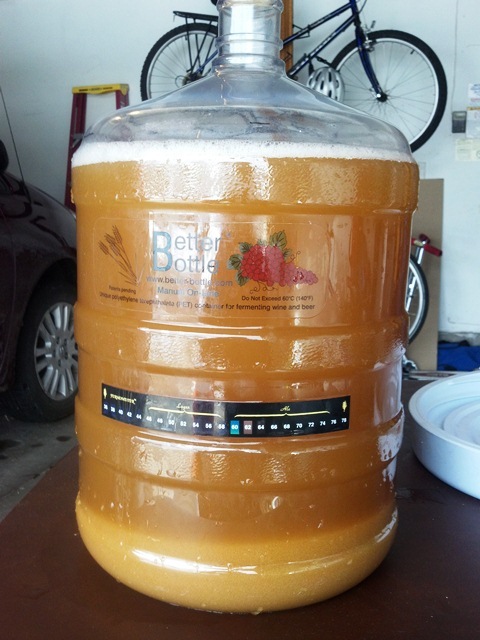 Saturday I mentioned that I was going to brew Whacko Wife Pumpkin Witbier Sunday. I didn't lie. It has been awhile since my wife (aka the SheppyBrew Beer Model) killed the keg of Boo Berry Wheat, and we have not really had anything in the keggerator for her since then. We have bottles of stuff she can enjoy, but she likes being able to pour from a tap. So, I knew I had to make something for the Beer Model. 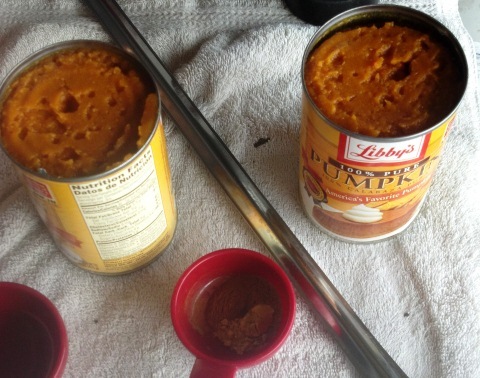 In September and October, I had been thinking of brewing a pumpkin beer, but just never got around to it. My wife really targeted pumpkin beers at GABF, so I was pretty sure she would like a pumpkin beer. At one point I had a crazy thought about making Whisky Wife Wit with pumpkin. It was just crazy (whacky) enough to be a good idea. I had to first convert WWW to all-grain to use as a base beer. Then I just thought I would add pumpkin and appropriate spices to complete this new beer. Brew day was awesome. It snowed overnight, so I brewed in the garage. It was cold, but I like brewing when the temperature is down. The steam coming off of the mash tun and pots is pretty cool to see. As usual now-a-days, I got started early in the morning and let the mash go through church. I really loved the smell and taste of flaked oats (aka oatmeal) in the mash. I used a grain bag in case of a stuck mash, but that did not present itself as an issue. The grain bag does serve the function of making clean-up of the mash tun easier, which is especially nice on days when the temperature is below freezing. My pre-boil volume and gravity was right where I wanted it, and the boil went great. 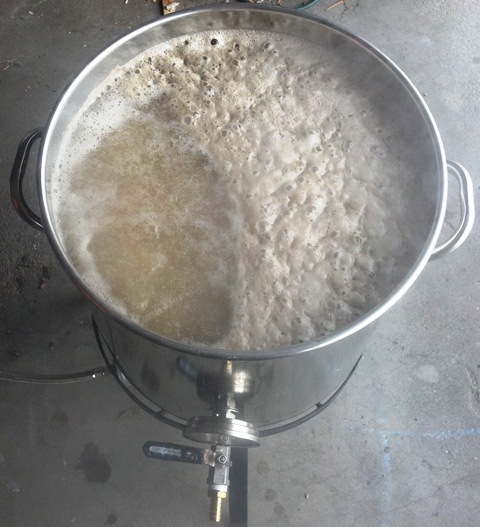 The combination of oats and wheat in the mash give the wort a real interesting look. I thought it smelled awesome too. I made an minor error on my first hop addition. The recipe had called for me to add my bittering hops at 50 minutes. I forgot that and threw them in at 60. In this recipe it is only about one IBU difference, so really who cares? I added the pumpkin to the boil in a grain bag somewhere between 5 and 10 minutes left. I added my pumpkin pie spices (cinnamon, nutmeg, and ginger) at 5 minutes. I had not nailed down the amount / type of spices until early in the day when I looked at a pumpkin pie recipe. The smell of the boiling wort when I added those spices was SOOOOOOO wonderful. 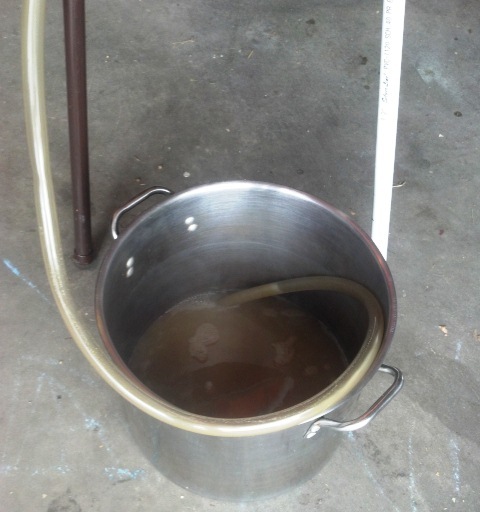 I cooled with my wort chiller to about 75ish and then left my carboy in a cold-water bath to get closer to 60. By the time I had the starter of yeast added, I had over 6 gallons at 1.051 OG. This would be too much to ferment, so after letting the yeast sit in the yeast for a bit, I racked a little more than a gallon into a Mr. Beer fermentor, leaving exactly 5 gallons in my carboy. Based on the flavor of the sample I took, I think I nailed this recipe. The pumpkin and spices seem to be exactly what I was thinking when I conceived the recipe in my head. There is just enough of those flavors and aromas that you can tell they are there. It does not overpower the beer, though. Of course, we will have to see if I think the same thing after fermentation is done. But I think both the Beer Model and I will really enjoy this beer. I am fast-tracking this fermentation and expect I will have it kegged and carbed by Christmas eve. Whether or not it is actually ready to drink then we will see. If not, we will simply let it age a couple more weeks. I am thinking of blending the gallon or so that I have in the Mr. Beer fermentor with my sour Rationalité Poison d'Ereeeek, bottling the blend. We will see how that turns out. The Bears lost to the stinking Vikings today, which makes me sad. At least I had a great brew day.